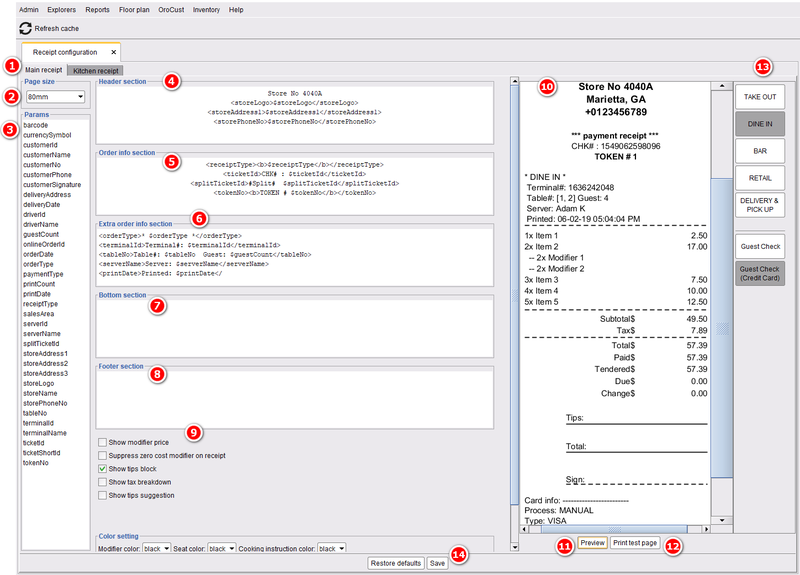 Unlike Floreant POS, ORO POS supports visual designer for receipts, Also ORO POS can handle multiple paper sizes. Update: In the recent build (144.x), ORO POS added support for ESC/POS printing. That speeds up printing several times. To change the look and feel of the receipts go to the back office. 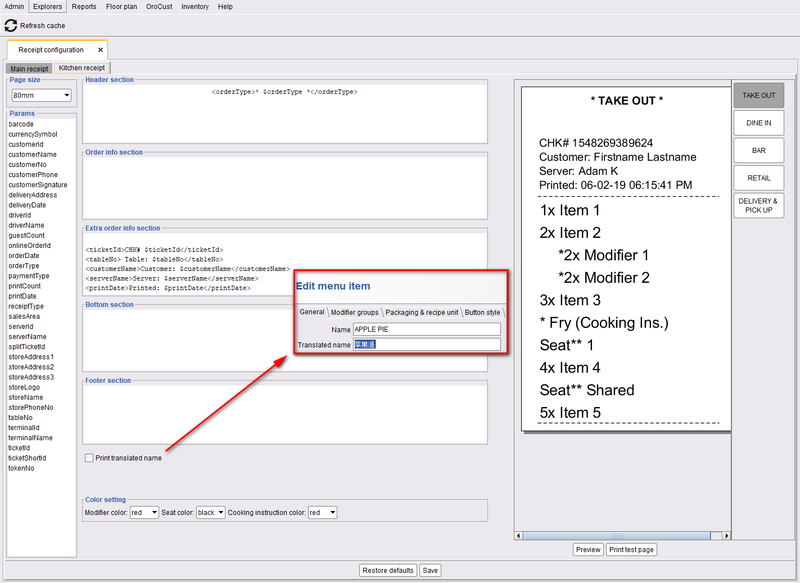 Then navigate to Back office–>admin–>receipt configuration and choose one of the receipt types (1) from the tabs. From right sidebar select your order type(13). Select “Guest Check” or “Guest Check (credit card)”. Select paper size from the options: 80mm,76mm and 58mm(2). Edit the following sections as needed. 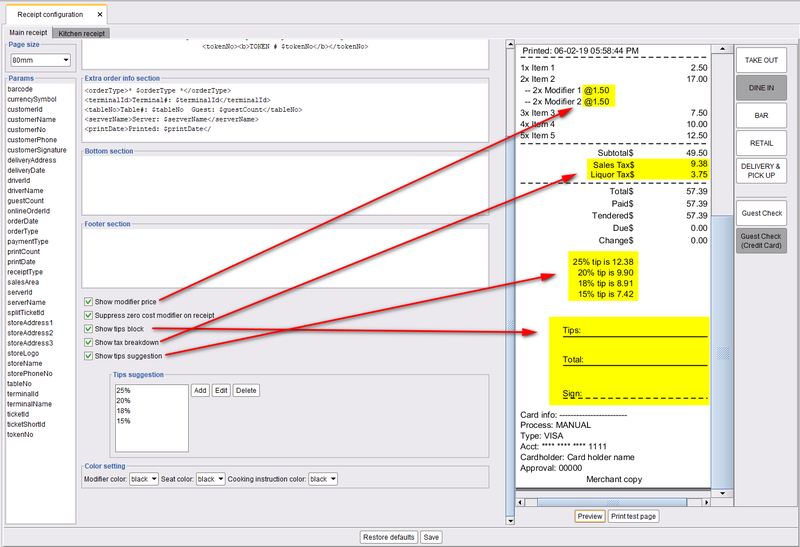 You can insert desired parameters by double-clicking on them from the left side(3). iii. Extra order info section(6). You can also adjust additional parameters if needed (9). ii. Suppress modifier price on receipt. Press the preview button(11) to see your changes(10). You can also make a test print(12). Print translated name. If you want to print the translated name of the menu items to the kitchen, turn on this feature.